I did this texture study in less than 10 minutes. The technique I was exploring was to use a large #3 brush set to about 30% transparency. I started at the top and worked my way down using the same “cross-stroke” technique. The #3 brush has a ragged start and end to the stroke. So, if you make short strokes it looks like multiple narrow strokes. This works great for clouds and bushes. 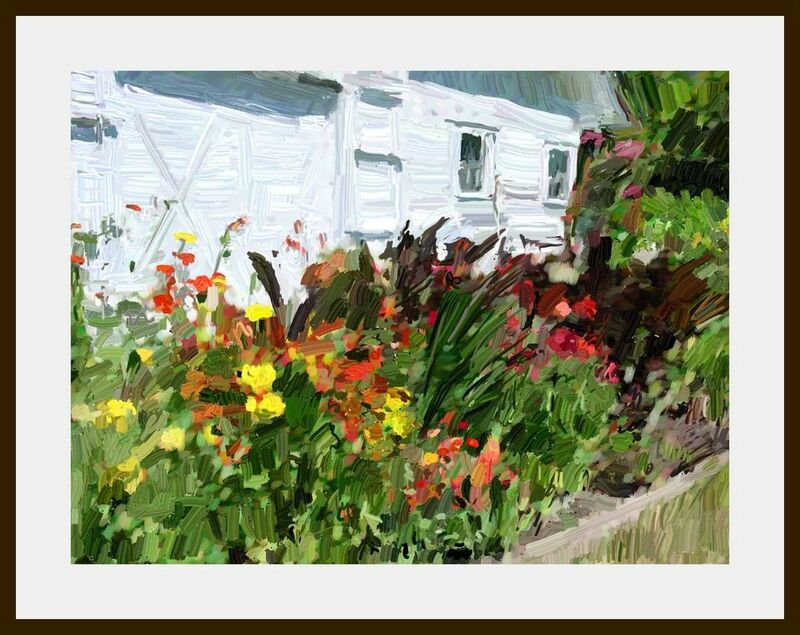 One way to start a painting with Brushes is to open an image that’s already stored in your iPod’s Photos. That’s how I started this one. I then filled the image with a transparent white so that it looked like a tracing paper image. 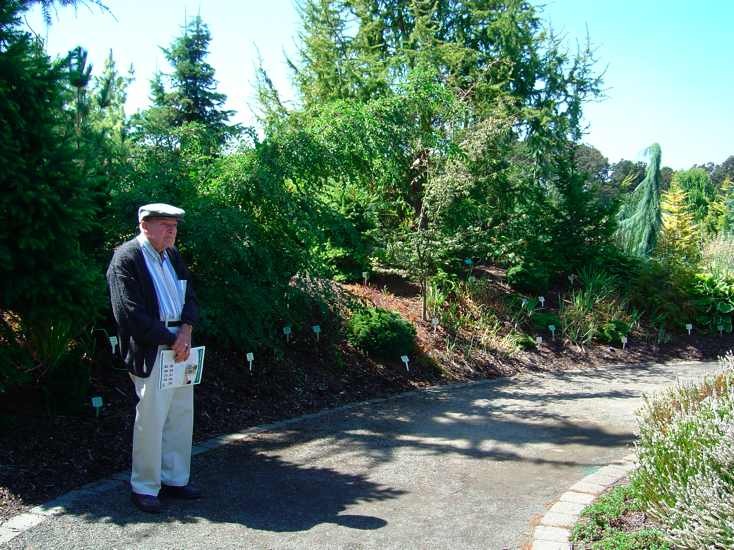 You can still see part of the image in the paper that he is holding. I first drew a line drawing of Dad and indicated that background shapes. Then I painted in the colors. I stopped at this point and didn’t add any more detail because I liked the look of the rough drawing. To arrive at the working image I zoomed in on the Touch and did a screen capture (by pressing the Home button and then the On/Off button). Then I opened Brushes and imported the saved image. 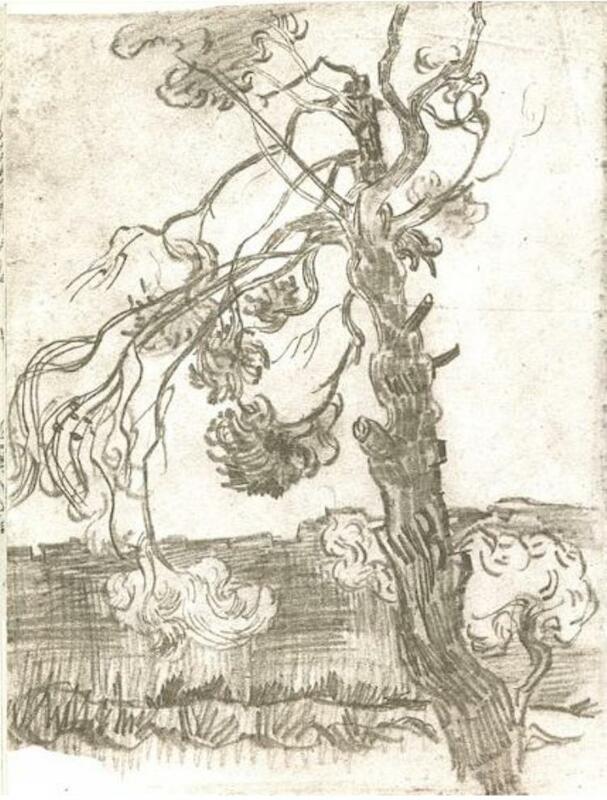 We have a very nice book on the complete works of Van Gogh by Jan Hulsker. I used one of his sketches as a reference for this drawing. I’ve been reading the book “Fast Sketching Techniques” by David Rankin (seems to be out of print and used copies are outragiously priced). This sketch is based on one of his from the book. He is using traditional tools (soft pencil and smudge stick). I’m trying to learn how to make fast sketches on location to use as aids to making finished paintings – testing layout ideas, color schemes, poses, etc. His technique is to first draw the basic shapes and then fill in the shapes with up to 4 shades of grey. Then if you have time, you can add detail. 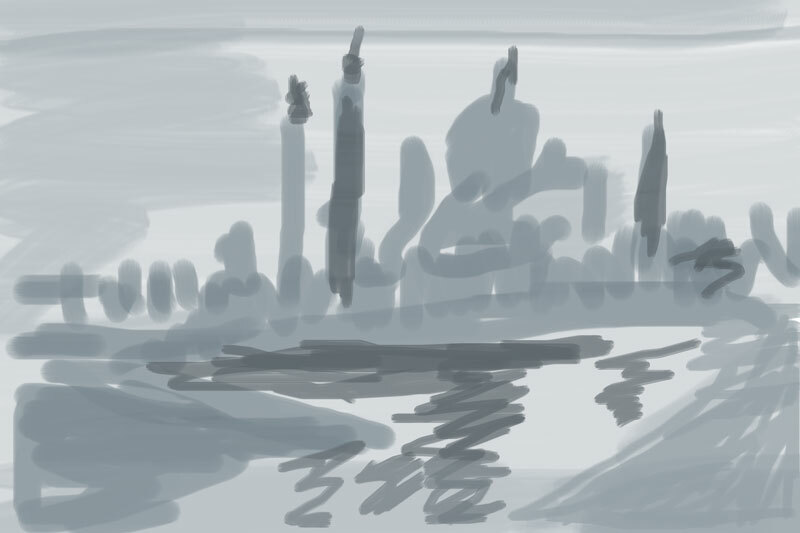 I spent just a few minutes on this sketch, but it captures the basic shapes, lighting, and mood. 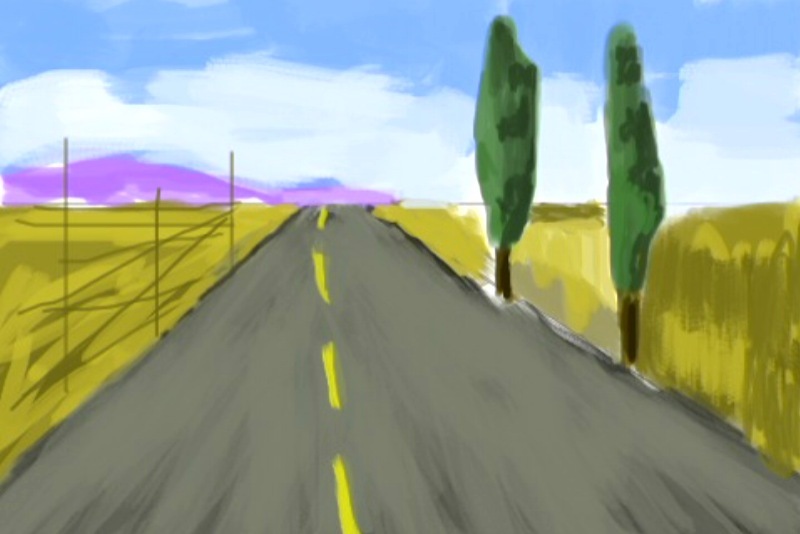 This is the first painting I did using the Brushes app and a Pogo stylus. I worked on it on and off for about a week refining it as i learned new techniques. I started with a grid that I made in Photoshop. I overlaid the same grid over the original photo and hand drew the basic shapes while looking at the photo on my laptop. After I blocked in the colors I could not longer see the grid so my proportions got off. The lighthouse is a bit long in the lamp. Since then I’ve made an acetate grid overlay for my iPod so I can check the drawing after the grid is painted over. 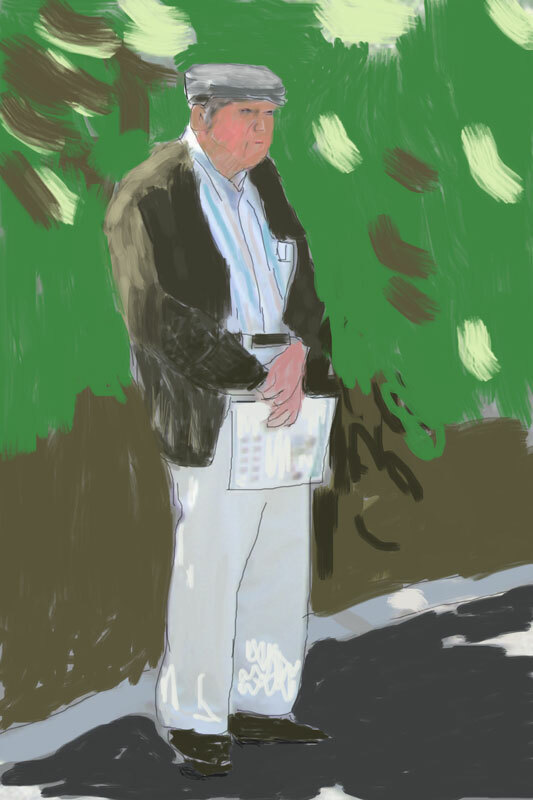 I soon discovered the Brushes app which (along with one called Colors) got excellent reviews. I checked them both out and decided to purchase Brushes. This is the first drawing I tried to test out the tools. I drew this with my finger in a few minutes. I like how you can blend colors together. I?? ?m continuing to learn how to use iDoodle 2 on my iPod Touch. 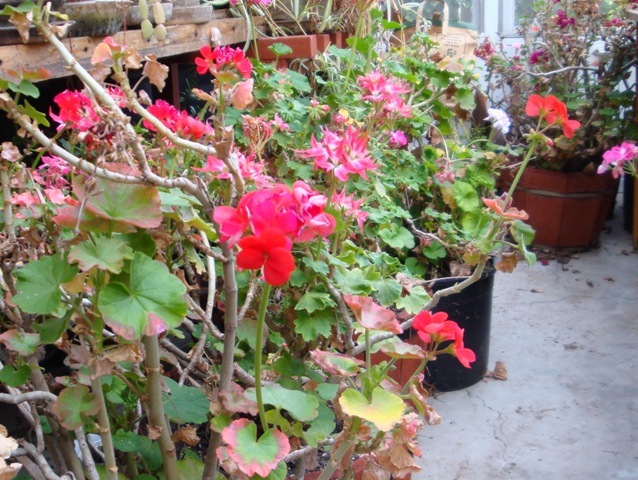 Today I sat in the greenhouse and did a quick sketch of the geraniums. I used the Blob tool and the Pen tool. You can set the Blob tool to fill with a gradation. It always fills from the top down so you can?? ?t do a side to side gradation. I work from the background forward layering shapes on top of shapes to create a three dimensional image. You can zoom in to do detailed work. I did the flower in the upper right hand corner while zoomed in. I did the sketch while looking at the scene and altered the actual location of objects to suit the composition. Here?? ?s a reference photo I took after I was done. 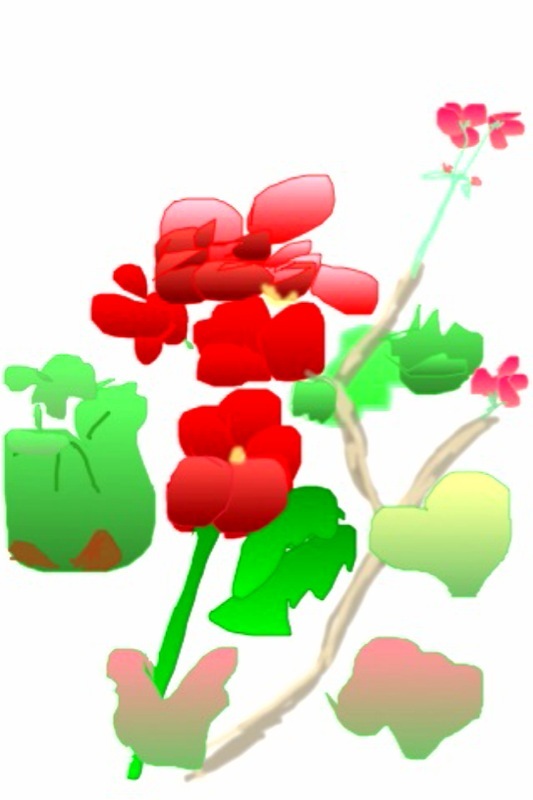 See if you can pick out which flowers and leaves I chose to draw. 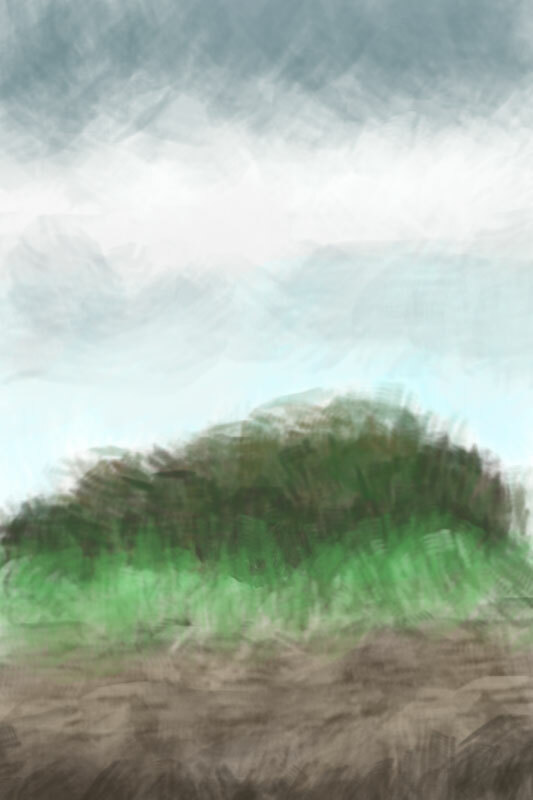 I’m learning to sketch with iDoodle 2 on the iPod Touch. It supports soft edges and transparency and the advanced color picker is RGB. I did the clouds using the pen tool with soft edges on and transparency set to about half way up. You can build up your color slowly. the palms were done with the blob tool. You draw a shape and it fills it in with the fill color and outlines it with the line color. 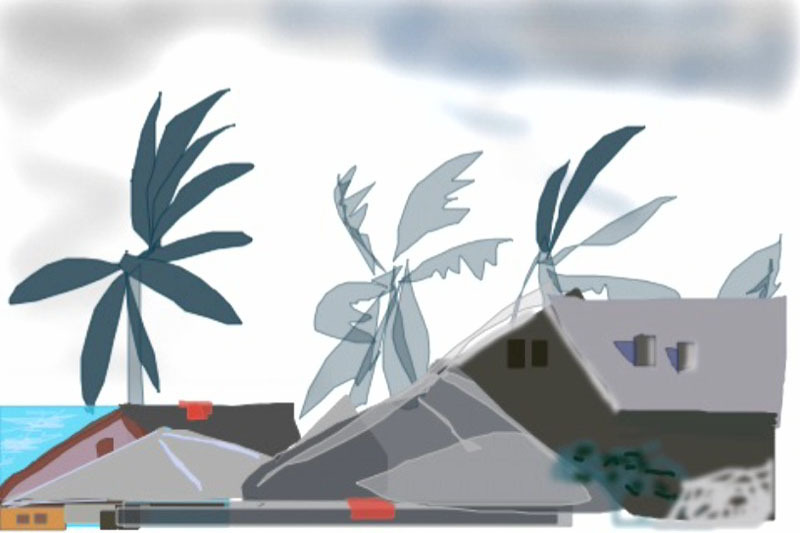 The buildings were done with the blob tool also and I used the rectangle tool to draw the windows. I used the pen tool to add the bushes in the lower right. You can save the image to your iPod’s image collection and email it to yourself. I then opened the file (jpg) in Photoshop and rotated it to be horizontal instead of vertical. The native size is 533×800 which is almost twice the size of the iPod’s screen (320×480). It looks fuzzy at this size. This could be used to capture quick ideas on location and it’s fun once you get the hang of it. By the way, I’m using the Pogo Stylus instead of my finger for more accurate drawing. Here’s the picture I was looking at when I drew the above image. 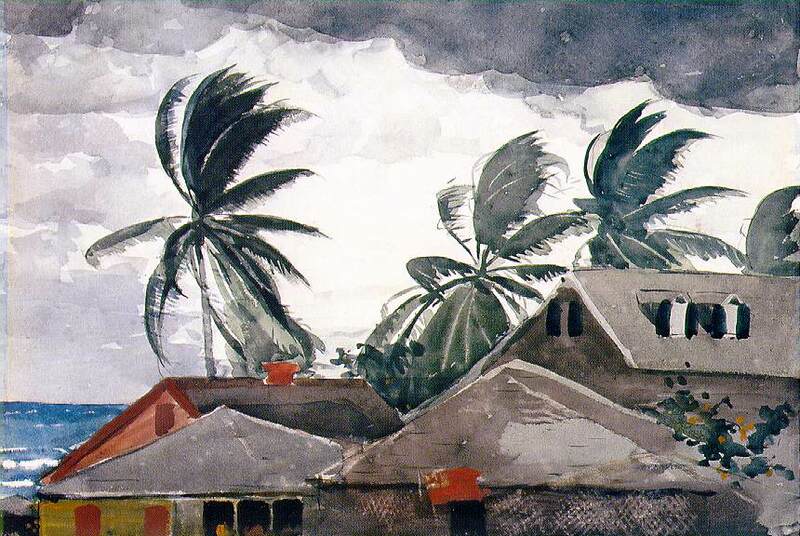 It’s Windslow Homer’s Hurricane – a watercolor painted in Nassau. 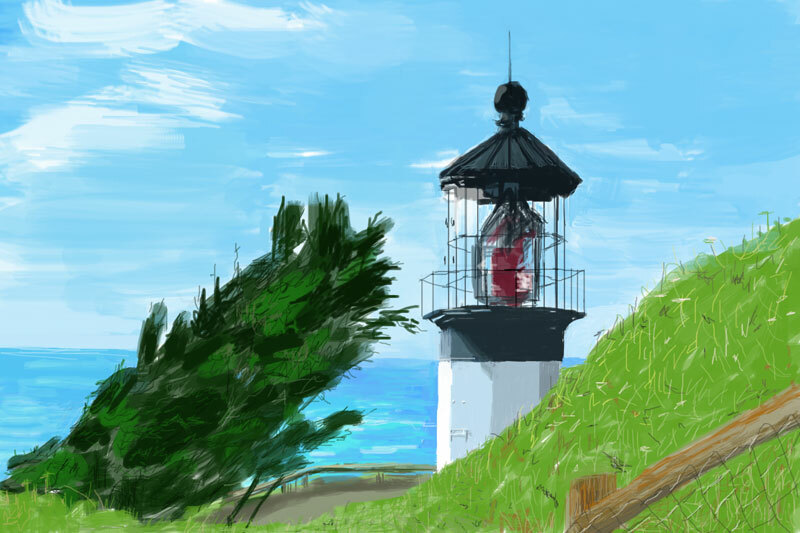 This is one of the first drawings I did with iDoodle 2. It can do geometric shapes like the ovals for the eyes, but best of all, it can do gradient filled “Blobs” which are free form drawn shapes. This is the first sketch I made on my iPod. It was done in the Sketches app. As you can see the possibilities are pretty limited with this tool. The color choices are few and the brush can change size but not softness. 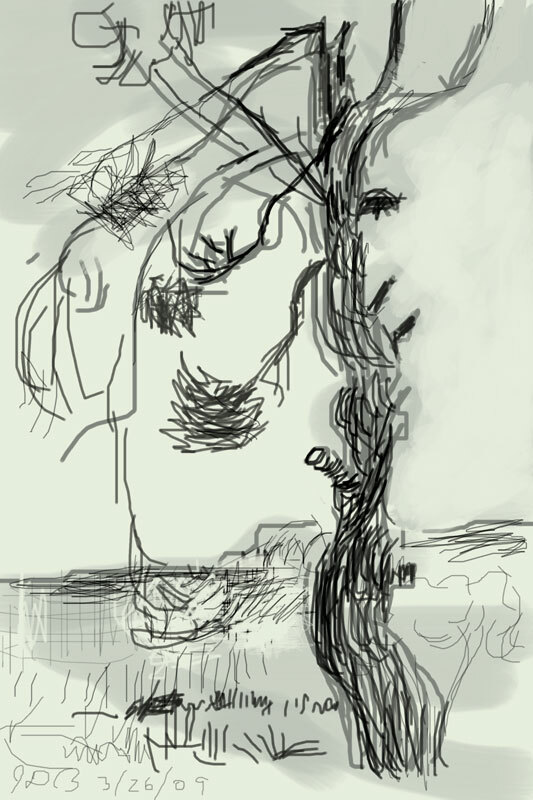 I quickly moved on to another app called iDoodle 2. I want to share one of my Flickr photos with you. It’s called: “Minto Island”.